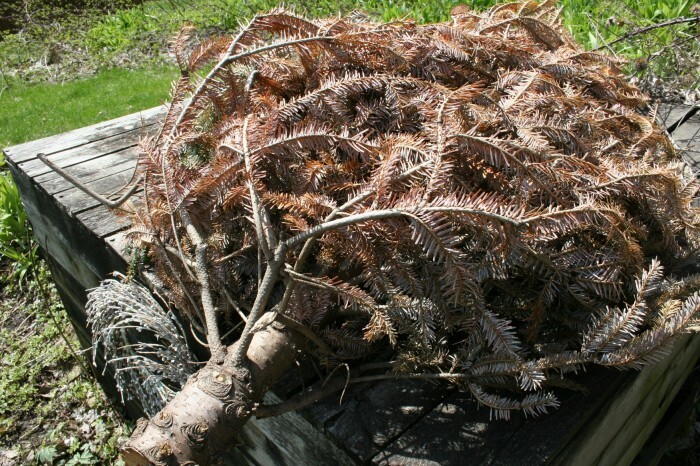 Don’t Throw Away Your Christmas Trees! For those of you in other Regions, contact your local FWP office. (MILES CITY) The Miles City chapter of Walleyes Unlimited and Montana Fish, Wildlife & Parks have teamed up to continue improving a popular local fishery. Used Christmas trees will be accepted again this year to later sink into Spotted Eagle Recreation Area to provide habitat for fish. A drop-off location has been set up at Spotted Eagle. The trees will be placed in the pond in the coming spring. Submerged and anchored trees increase habitat complexity, provide hiding cover for juvenile fish and nesting cover for some species of adult fish. “This Christmas tree project has been an ongoing activity at Spotted Eagle, and we see the fish using the structure when we conduct electro fishing surveys on the pond,” said Region 7 Fisheries Biologist Caleb Bollman. Questions about the project or tree donation should be directed to Kevin McKoy, Region 7 Fisheries Technician at 234-0915 or kmckoy@mt.gov, or Bollman at 234-0914 or cbollman@mt.gov.